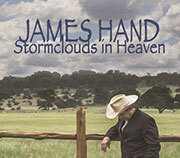 James "Slim" Hand that country singer from Waco, Texas who amazed and delighted New Mexico folks at a Santa Fe Bandstand show last year, has a new gospel album set for release in October. I've been lucky enough to hear an advance version of Stormclouds in Heaven, so I can tell you, it's a pure country gem. Read the full review on Steve Terrell's blog. "It only took James Hand 40 years to become an overnight (cult) sensation." "This is an outstanding collection of truly great Country music and a great feather in the cap of grassroots label, Hillgrass Bluebilly Records." Read the full review on Outlaw Magazine. "Mighty Lonesome Man stays true not only to James Hand's sound, but to the ghosts of the musicians that mapped the territory he now walks." Read the ful review at Soaked in Sound. "James Hand does it again! The album Mighty Lonesome Man is one of the best country albums I have heard in a long time. His band consists of legendary artists and he has put out a legendary album with amazing sound and phenomenal lyrics. James Hand is genuine and makes the best true country, outlaw country and make-you-feel-good down-home-music which can all be heard on this album." Roothog Radio named MIGHTY LONESOME MAN their CD of the MONTH! One of the TOP TEN albums of the YEAR! Critics are fond of pointing out how 57-year-old Texas troubadour James Hand's music is a sharp rebuke to the '80s-influenced pop rock that passes for mainstream country these days. In fact, the liner notes to Shadow On the Ground (Hand's second Rounder album, fourth over all) assert that point most emphatically. But it also happens to be a sharp stick in the eye to a lot of alt-country or whatever it's called now. (One seasoned and much decorated Music Row producer believes alt-country really means "out of tune," but that's another story.) Many are the celebrated so-called keepers of country's true flame working below the multi-platinum radar of, say, Taylor Swift and Carrie Underwood; few of those even belong on the same stage with Slim, as Hand's friends call him. Produced by the formidable tandem of Lloyd Maines and Ray Benson, Hand's Shadow On the Ground seems almost an impossibility-country music so deeply rooted in the genre's honky tonk roots it gives nary a nod to contemporary conventions. Even its one cover-wait for it-wait for it-of the Ray Evans-Jay Livingston classic American pop evergreen, "Mona Lisa," with Benson adding a Spanish-tinged electric guitar line and Eddie Rivers crying longingly on the steel, dares not advance any further for inspiration than Carl Mann's similarly propulsive 1958 Sun single of same (Nat King Cole is nowhere in sight, except in blessed memory), but even so Hand's sprightly take occupies ground for which it holds the sole deed. Some finicky types will no doubt deduct points from Hand for sounding so unsettlingly like Hank Williams-and sometimes his phrasing and timbre are so similar as to be downright eerie-and those complaints might be valid if it were possible to detect a single false or studied note in Hand's delivery or personality. Okay, he may not always sound as bedeviled as Hank could in his most mournful, tear-drenched throes, but really, listen to the sustained ache in Hand's voice and allow yourself to give in to the total crumbling of the soul he describes in testifying to his undying love for a gal who denied him in the poignant, steel-drenched heartbreaker, "Just a Heart." This is brutal, raw-boned damage he's articulating, and the little bubble in his delivery presses the point ever more dramatically with each new verse. On the other hand, the delightful, brisk stomp of "What Little I Got Left" betrays a John Anderson-style sense of the absurd in his witty wordplay, and darn if Hand doesn't evoke a tinge of Anderson's wry delivery in pledging the remainder of his sentient self to an attractive dame, getting a little instrumental help in the urgency department from Maines's cascading pedal steel lines and some frisky, sputtering electric guitar courtesy Will Indian. But then on the bittersweet ballad, "The Pain of Loving You," the artist's deep, throaty, emotionally ruptured attack recalls no one so much as our man Lefty Frizzell, from whom Hand has clearly learned a lesson or two in the department of epic hurt. All this is by way of saying James Hand hits on some admirable touchstones in fashioning his own style, but in the end it is indeed his style, his original voice, his crafty way with words, his uncompromising country music. Those he didn't convince with his other albums, especially his appropriately titled 2006 Rounder debut, The Truth Will Set You Free, might be persuaded by this outing, perhaps in increments, as each new song unfolds and he lays himself on the line, often baring a broken heart unabashedly, but also bringing a touch of wit to his dilemmas in humorous tales such as "Ain't a Goin'." Hand will have won hearts and mind well before the record ends, but when it does, with the joyous bluegrass gospel celebration of "Men Like Me Can Fly," replete with red-hot fiddling by Jason Roberts and resonant dobro punctuations courtesy Maines, a listener's soul may well find itself airborne, following Hand's wherever it may lead. Then hit the repeat button, because once is not enough. Site and all contents ©2003 - 2013 by James Hand or copyright holder.